The term is the basic unit in Lucene indexing and searching, to query a term you need to create index and index data then create query object that contains terms you want to search. This example illustrate how to do term query in Lucene. To know more about term What is Lucene Term. 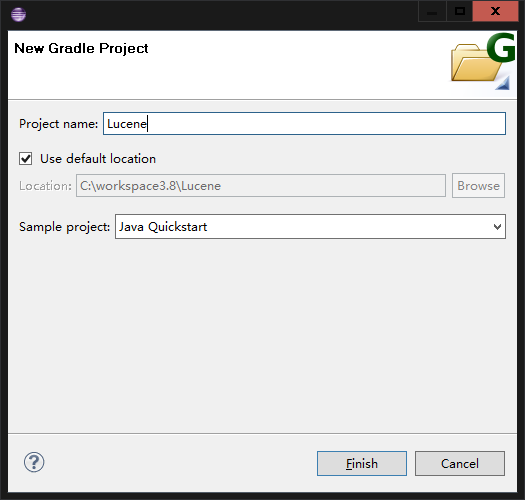 Go to Eclipse File -> New -> Gradle project to create a new Gradle project. And select Java Quickstart sample project. 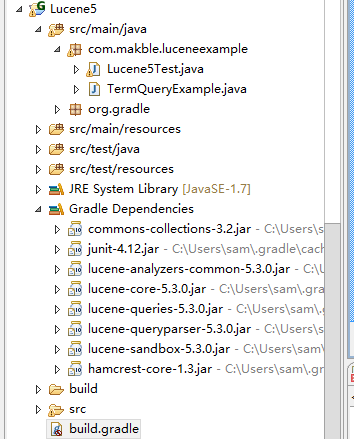 We need to use Lucene 5.3.0 in this project, modify the build.gradle file as below. First we should add a new class to the project, TermQueryExample.java. To search a term in Lucene, we must have an index. An index is like a database, unlike relational database which save your data in tables and using SQL to retrieve the data, Lucene index stores rich documents in inverted index format. Stores the raw data in Lucene is optional, a common usage pattern is save data in traditional database store like relational database or NoSQL store like MongoDB and save index in Lucene, Lucene itself only keeps the primary id that point to data store. This is so called Not Index Here. To create an index in Lucene, you need several components: the analyzer, the index directory and index writer. Analyzer breaks your text into terms, index directory is where you store index data structure, it can be flat files or in memory, for demonstration, this example use in memory index, the index writer accept documents and apply the analyzer to documents then update the index. In our document, there are two text field, the author and title of a blog post. The first column is the document id, this is allocated for each document at index time, and then the fields of the document. It also shows the number of matched documents. Note that TermQuery is case sensitive, because in standard analyzer, all term are lowercased, so search for "Example" has no matches. Text are broken to words, there is no term such as "title:lucene example" in the index. As you can see the last two query didn't match any documents. The TermQuery object mostly is used to construct complex queries in combination with other queries pragmatically, it's not supposed to accept user input queries. To accept user input we need query parser, which will analyze the input and turn it into various query object, the term in query may be first convert to TermQuery object and then combined with other terms in the query. To make more flexible and user friendly queries, you can use QueryParser. Just type anything you interested and let the parser to construct query object for you. QueryParser is the default and very basic parser in Lucene. There are many other query parsers that serves different purpose for example MultiFieldQueryParser , PrecedenceQueryParser , Xml-Query-Parser, DisMax , etc. When the default parser can fulfill the requirements, consider these specialized parsers.